Rules imposed under UN laws to enable the freezing of terror suspects' assets are not lawful because they "bypassed" Parliament, the High Court has ruled. 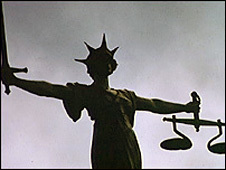 Mr Justice Collins allowed challenges by five men whose assets were frozen under the Treasury-imposed powers. The men are designated terror suspects but have not been charged. The rules are seen as a key plank of government anti-terror strategy. The Treasury said it was "disappointed" with the judgement and would appeal. The five, known as A, K, M, Q and G, were designated terror suspects last year under two Orders in Council set up to apply UN Security Council resolutions in the UK. Suspected of "facilitating acts of terrorism", they were denied control of their own property and money. Mr Justice Collins said Orders in Council were not subject to the same Parliamentary scrutiny as normal legislation, each being laid before Parliament the day after it was made and coming into force the day after. He said this was not the proper way to approach asset-freezing and that Parliament should step in. He gave the Treasury leave to go to the Court of Appeal, delaying quashing the orders until then. Jonathan Crow QC, for HM Treasury, had told him the UK government would be left in violation of a UN Security Council order were the orders to be quashed immediately. The Treasury said the asset-freezing regime and individual asset freezes would remain in place pending the appeal. A spokesman said the asset-freezing regime made an "important contribution" to national security by helping prevent funds being used for terrorism and was "central to our obligations under successive UN Security Council resolutions". Lawyers for the five had argued in court that the asset-freezing regime was harsh and unfair - arguments the judge said were "entirely persuasive". He stressed he was not saying that freezing orders should not be made to comply with UN resolutions but said parliamentary approval should be attained. The ruling comes as a blow to the prime minister, who declared the Treasury "a department for security" when he introduced the rules. Under them, some 70 suspects are currently listed and bank accounts containing about £500,000 have been frozen. Solicitors for the five men welcomed the ruling, saying it was of "the highest constitutional importance". The men had complained to the court that the orders had a "devastating and humiliating" impact on their lives. Their solicitors said in a statement: "The ruling today has shown that the government is willing to sacrifice the fundamental rights and liberties of its citizens, including the fundamental constitutional right that only Parliament can take away basic freedoms, when they think it convenient to do so." They said the rules were not only harsh but "absurd". "We have the madness of civil servants checking Tesco receipts, a child having to ask for a receipt every time it does a chore by running to the shops for a pint of milk and a neighbour possibly committing a criminal offence by lending a lawnmower." The Terrorism (UN Measures) Order 2006 and the 2006 al-Qaeda and Taleban (UN Measures) Order were made under section 1 of the 1946 UN Act in order to implement resolutions of the UN Security Council. The 1946 Act allows Orders in Council to be used to bring in special powers only where it is "necessary and expedient", the judge said. He said fundamental human rights were involved, adding: "In my view it is essential that Parliament considers the way in which what is required should be achieved and it is not proper to do it by relying on section 1 of the 1946 Act."